My older brother is autistic and having spent my entire childhood explaining to countless people what "Autism" was, it is so refreshing now that people are trying to learn about it and understand it. I can only hope and pray that the efforts of so many to increase autism awareness will better the lives of children with autism and the families that sacrifice so much of their lives in caring for loved ones with autism. 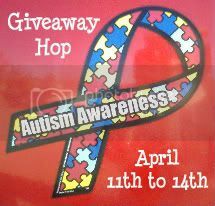 This week, 66 blogs are participating in a giveaway blog hop related specifically to autism and raising awareness. Prizes range from amazon giftcards to books about those dealing with autism some way in their lives. Please go enter some of these giveaways if for no other reason than to read the stories and gain a greater understanding of autism. For additional resources, please visit the Autism Society website. Thanks for doing this Judy- about autism I mean. It can be so very hard as you well know but people with autism really do give us so much and help us be better. Thank you for supporting Autism Awareness. I kept see your name on the differents blogs and had to write. communicate more than he ever did. The last time I saw him (we live in a different state), we were at a fast food place and he said "Ketchup, please". I cried, I was so happy! Very interesting! I have some friends who will want to participate for sure! Thanks for posting!